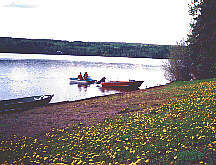 Location: From Quesnel, cross over the Fraser River and head west on the Nazko Road for 35 km 21mi). The lake is on the south side of this good gravel road. 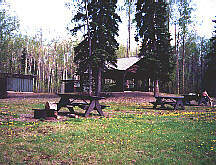 Resorts & Campsites: A picnic and recreation site with outhouses is available. Quesnel is the closest centre for facilities and services. Fishing Report: The wild stock rainbow trout can reach about a pound, although they are known for being quite elusive. Viewscape: The hilly surrounding area is predominantly forested, with a mixture of aspen, willow, cottonwood and Douglas fir. Pastureland composes about 10% of the lakeshore area. Shoreline: Sandy, gravel soil comprises most of the shoreline with a small amount of willow in evidence. Puntataenkut Lake: Puntataenkut Lake (also known as Tibbles Lake) is located about 6.5 km. (4 mi.) west of Puntchesakut Lake. This 279 ha. / 690 acre lake reaches a maximum depth of 14.9 m. / 49 ft. and is home to both Rainbow Trout and Char.